We’re taking a slightly unconventional route with this review and starting off this review not by talking about the film itself, but rather the experience of actually watching it in a cinema. The screening we were at for Hail, Caesar!, the latest film from the Coen Brothers, was fairly packed; not sold-out, but more people than usual for a film like this. The adverts play, some of the trailers get a few laughs, the movie begins, and then… silence. Nothing but silence for the entire running time of this movie. Everyone was just sitting there in stone-cold silence, not saying a word even in whispered conversation, patiently watching the film instead of laughing or even expressing any kind of emotion. We even had to turn around at various points to make sure that another person was even there. It was rather startling, because we had no idea what to make of their non-reaction; it couldn’t have been that bad, because there were zero walkouts at any point, nor could it have been fantastic, because they would have been responding much more to the moments of humour and drama. Even when the film ended and the credits started showing on the screen, it took people a good few seconds to even make an effort to stand up and exit the auditorium, and when they did there were no immediate reactions or even passing conversations along the lines of “that was terrible” or “I loved that”. Not surprisingly, we eventually saw that audience response on the Internet was just as muted; on Rotten Tomatoes, it has a 45% rating from audiences, as opposed to the 83% rating from critics, with certain patrons even giving it a C- score on CinemaScore (keep in mind they rated it lower than Dirty Grandpa, which got a B on the site, and even Alvin and the Chipmunks: The Road Chip, which – and we wish we were making this up – was awarded A-). Not that this is unexpected news for Joel and Ethan Coen; after all, the filmmakers have not had everything they’ve done be immediately praised the moment it debuts. Take The Big Lebowski, for instance; it originally opened to horrendous reviews across the board, yet today it is being praised as a cult classic to end all cult classics. That is perhaps their most famous case of this happening, while other underappreciated films of theirs like Raising Arizona, The Hudsucker Proxy and The Ladykillers eventually found their own audiences as well. It seems that we have just experienced with Hail, Caesar! perhaps what others experienced when they watched those movies for the first time – but does it really have what it takes to eventually obtain an audience of its own? It’s too early to tell, but we definitely think there are things about it that can stand the test of time. The film is basically a day in the life of Eddie Mannix (Josh Brolin), a “fixer” for 1950s Hollywood studio Capitol Pictures – the same fictional studio, incidentally, that the Coens heavily featured in their classic film Barton Fink – who has to deal with several problems and avoid them getting out into the press, from hiding the pregnancy of an Esther Williams-type aquatic star (Scarlett Johansson), to finding missing star Baird Whitlock (George Clooney) who has been kidnapped by Communist screenwriters whilst filming the titular Roman Biblical epic at the studio. Mannix also faces a divisive casting decision when cowboy actor Hobie Doyle (a film-stealing Alden Ehrenreich) is suddenly thrust onto the set of a sophisticated costume drama directed by Ralph Fiennes’ Laurence Laurentz, as well as a tempting offer for a career outside the studio walls. 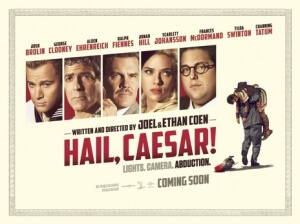 Perhaps people were expecting so much more from a film that seemed to promise so much in what we now believe to be somewhat misleading trailers, but then again the Coens have never exactly been eager to make crowd-pleasers; they just go out there and make the kind of films they want to make, and Hail, Caesar! is no exception. They take advantage of its vignette structure to showcase their appreciation for old-fashioned methods of movie-making, as we get to see scenes from various films being made that do have a genuinely appealing sense to them, invoking the classic saying of “they don’t make ‘em like they used to” (a tap-dancing number with Channing Tatum is a particular highlight), and it’s in these moments where the film is at its most entertaining. It is also an extremely well-made movie, with cinematographer Roger Deakins in particular creating a series of rather stunning visuals that make you wonder why he’s not got his long-overdue Oscar yet. Perhaps this is the kind of film that requires re-viewing over extended periods of time, one that perhaps we as a collective audience might not fully appreciate now but might just do so in years to come. It worked for The Big Lebowski, so who’s to say that in 10 years’ time Hail, Caesar! won’t be thought of in the same way? Hail, Caesar! is a film that will not resonate immediately with general audiences (though ask us that again in a decade’s time), but for now is an amusing love letter from the Coen brothers to the old styles of filmmaking that, as this movie’s vignette structure proves, can still bring a sense of joy to anyone who loves film like they do.